What is the purpose of the 3 Shelf Tray Trolley? The 3 Shelf Tray Trolley is a beautifully designed product that can make daily tasks simple. The maximum capacity for the whole unit is 600kg. Having 3 solid selves is great for heavy items and supplies. 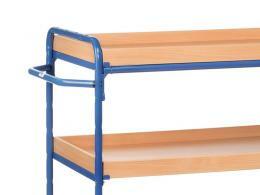 The total recommended weight per mid and upper shelf is 120kg. The shelves are constructed from beech grain laminate and have a lip for holding in supplies. Non-marking grey TPE wheels. 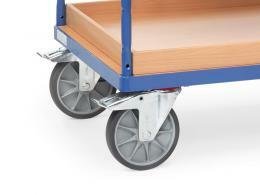 There are 2 swivel tyres that enable the trolley to be moved with ease. Two of the tyres can be stopped with a brake for stationary tasks. A handle is located on the side for moving the shelf trolley. The trolley frame is made from powder coated steel and is available in the colour blue. The shelf heights are set at 269mm, 669mm and 1069mm. Where can this Tray Trolley be used? 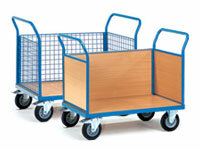 The trolley can be used in a factory, a sorting facility, a warehouse or office buildings. The trolley is very versatile and would be an added benefit to most work environments. Offices can utilise the cart for extra space for supplies and files. Factories can use the trolley for paperwork for different departments and tools. A warehouse can sort packages and orders for shipment. A sorting facility can place packages on the unit for different delivery locations. Who might use this Shelved Cart? 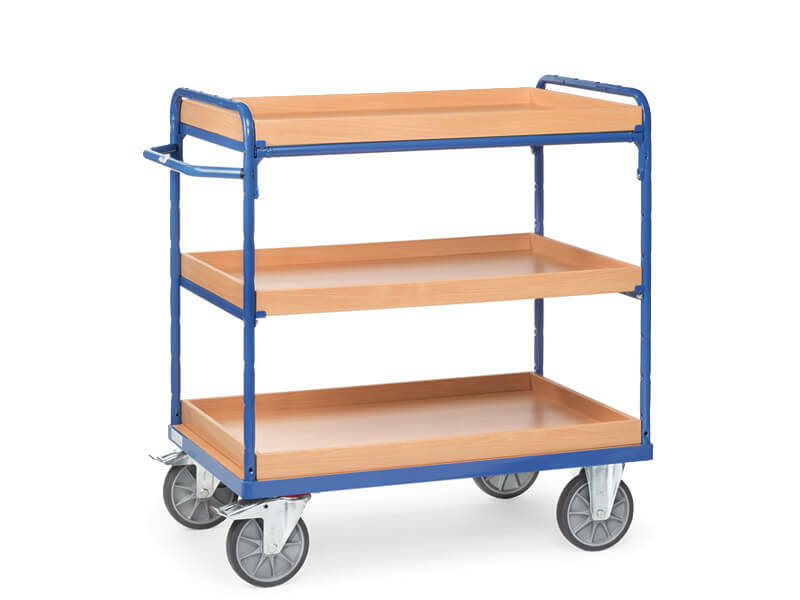 Any staff member can use the cart for daily tasks and weekly projects. Files and other paperwork can be separated and managed easier. The lipped shelves can be used to make items easier to store. The rim will hold items in place and materials tidy. The trolley can be moved with ease and can hold several different types of items. Specifications The trolley is perfected with high quality materials. The product is highly durable under normal work conditions.